The orbiting sister spacecraft to two NASA probes thatslammed into the moon last week has beamed home images and temperature maps ofthe two intentional crashes. The Diviner instrument aboard NASA?s powerful Lunar ReconnaissanceOrbiter took infrared observations of the impact, flying over themoon crash site of the agency?s LCROSS probe and its Centaur rocket stageabout 90 seconds after impact at a height of about 50 miles (80 km) up. 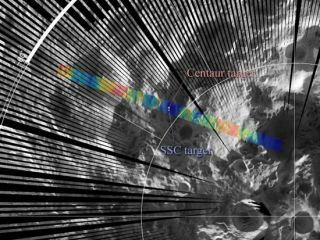 The LCROSS mission is aimed at detecting signs of water icein the permanently shadowed craters at the moon's south pole by purposelycrashing spacecraft into the lunar surface. The mission?s 2.2-ton empty rocket stage walloped a cratercalled Cabeus at 7:31 a.m. EDT (1131 GMT) on Friday. Four minutes later, the LCROSSshepherding craft followed suite. After the impact, Diviner observed the site on eightsuccessive orbits, and obtained a series of thermal maps before and after theimpact at approximately two hour intervals. Diviner is an instrument that maps the surface temperatureof the moon in the infrared range of the light spectrum. The thermal maps takenof the Cabeus crater last week show the thermal signature of the impact. LCROSS itself observedthe crater made by the Centaur stage impact in its last few moments beforeits own death plunge. It still remains to be seen, however, whether the crashescreated the vast plume of moon dirt that scientists predicted would blast outof the crater up to heights of 6.2 miles (10 km), where it could be lit up bythe sun and visible to observers on Earth. So far, astronomers using ground-based telescopes and theHubble Space Telescope in orbit have not reported seeingany ejecta plume, but have cautioned that more time is needed to be sure. Last month, scientists announceddefinitive proof that small amounts of water exist elsewhere on the moon ina molecular form attached to lunar dirt. NASA launched the $79 million LCROSS mission ? short forLunar Crater Observation and Sensing Satellite ? in June alongside the LunarReconnaissance Orbiter.